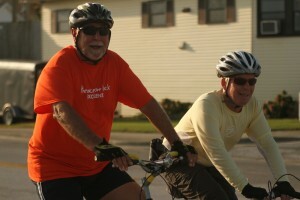 The 4th Annual Cycling for the Coast fundraiser took place on Saturday, September 13. Over 150 people of all ages and cycling experience came out to celebrate our coast by riding along the beautiful island of Bogue Banks. Though the weather forecast was sketchy, storm clouds faded just in time to provide a warm and sunny morning. Before the ride, cyclists were able to enjoy coffee provided by Starbucks, and free bike maintenance from the Bicycle Gallery in Jacksonville. With the firing of a civil war musket from a Fort Macon Park Ranger everyone began and ended their course by the Park’s Visitor Center, and chose between distances of 20K, 40K, or 80K. After the ride, participants celebrated their finish with lunch at an after-party hosted by McCurdy’s Restaurant with beer from Natty Greene’s Brewing Company. The federation is ever thankful for the support of several local sponsors and volunteers who made this ride possible. All proceeds from the event are being used to benefit education and restoration projects in the central coast.